Valentine’s Day is most commonly celebrated with a significant other. Why can’t it be a day spent providing self-care and pampering yourself? 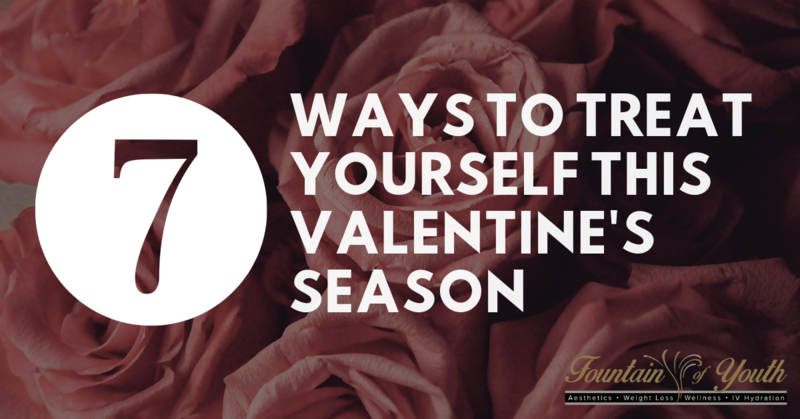 From a relaxing massage to a spa day, treat yourself this Valentine’s Day with these seven fun ideas. Valentine’s Day doesn’t have to be spent in a romantic restaurant or even at home; get outdoors enjoy the beauty around you. Spend the day doing what you love such as going to the beach, hiking, biking, or discover the city around you by going on a historical walking tour. Don’t let the thought of being single on Valentine’s Day stress you out! Stretch out and de-stress this holiday by attending one of Fountain of Youth’s awesome yoga sessions. The Fountain Fitness welcomes all yogis who want to recharge and reset their mind and body. Going to the movies on Valentine’s Day with just yourself means no deciding on showtimes, genres or sharing of the popcorn. Sure, you may be surrounded by couples snuggled up enjoying the flick but only you decide if you want to stay for the credits. Sit back, relax and rejuvenate this Valentine’s Day with an IV Hydration Therapy session at Fountain of Youth. We have a variety of IV Hydration Therapy sessions that are designed to kickstart your immune system, enhance your beauty and wellness, relieve tired muscles and provide relief of migraines. Each one is equipped with essential vitamins and fluids your body needs. Put your best face forward with any one of our facial services at Fountain of Youth. We offer exclusive spa services including high-frequency facials, chemical peels, dermaplaning, Botox and Juvederm injections, and laser hair removal. Each one of these services is designed to help reduce the appearance of wrinkles, dark spots and give your face an improved youthful appearance. Grab your best gal pals and take the city by storm on Valentine’s Day. Dine at a nice restaurant, indulge in some treats at a local bakery, share a bottle of champagne, or just hang out at the house sharing past bad date stories. You’ll enjoy the time reconnecting with those who haven’t left you with a broken heart. Valentine’s Day isn’t just for those with a special someone. Show yourself some love this holiday season with these fun ideas and you won’t think about anyone else. Spend your Valentine’s Day with us at Fountain of Youth. Visit us at 6729 Spanish Fort Blvd. Ste BC in Spanish Fort, Alabama, call us at (251) 525-8446. Is hCG Weight Loss Right for You?